Dianne Feinstein is a traitor. Dianne Feinstein has funneled over 1 billion in contracts to her husband Richard Blum’s URS … just one of his companies to which she has funneled money stolen from the people of America. She has also with our money helped him profiteer from bankster foreclosures. Feinstein was forced to resign from the military construction appropriations subcommittee because of her criminal acts. She deliberately falsified intelligence and voted, unlike most Democrats, to give the unelected Bush authority to rain fire and death on Iraq. 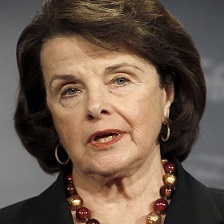 Feinstein was a tool of the Israeli government in claiming falsely in 2002 that Saddam Hussein had nuclear weapons. Feinstein opposes assault weapons in the US while voting for 30 billion dollars a year for assault weapons, fighter jets, and other armsmongering for the fraudulently installed Netanyahu government. Her husband Richard Blum was involved in Cosco’s gun running in San Diego. Her husband’s investment in Chinese shipping is one of many factors in the failure of the US government to inspect more than 5% of incoming crates. Her husband’s role as past chairman and present member of the Univ of Calif. Board of Overseershas helped make that state the most aggressive denier of the 1st amendment for peaceful protesters against UC vivisection. Blum was active in lobbying for AETA and pressuring for its unconstitutional enforcement. Feinstein has many times violated the sovereign will of the people of California, ignoring their overwhelming support for immediate withdrawal from Iraq and Afghanistan. The government’s investigations of the Feinstein/Blum corrupt connections to Chinese money have only partially been investigated. Like those of Mitt Romney, Henry Kissinger, Henry Paulson, Warren Buffett and Rupert Murdoch, Feinstein’s Chinese money connections are in conflict with the interests of the people of the US and in conflict with the role of an intelligence chairman. In 1994, Feinstein ignored human rights issues in China and led the effort to renew most-favored-nation trade status for China at a time when her husband was preparing to invest $150 million of his clients’ money, along with $2 million to $3 million of his own, in China. Feinstein has been silent about the 911 Israeli govt’s role in the WTC plot. Feinstein pushed for the leasing of a South California naval base to a Chinese company Cosco with which her husband has financial ties. Dianne Feinstein’s husband wins near-billion dollar California ‘high speed rail’ contract. To the surprise of absolutely no one familiar with the ways of Corruptifornia, the one-party state completely in the hands of the Democrats, a consortium whose lead firm is controlled by Richard Blum, husband of Sen. Diane Feinstein, was awarded a nearly billion-dollar contract for the construction of the first phase of the so-called high-speed rail line to link San Francisco and Los Angeles. Those paying attention to the project call it the “half-fast” rail line because it will share trackage with conventional commuter rail trains in the sprawling Los Angeles and San Francisco areas, lowering its average speed to levels achieved by American railways a century ago. There is no doubt Dianne Feinstein and her husband are self serving traitors, especially in the world of high-speed rail that is sure to cost at least twice what it is budgeted at (just south of a hundred billion dollars), take five hours for a journey that takes an hour or so by air, and which will have to charge much more than airlines do for the trip.